Rajkumar Agro Engineers Pvt. 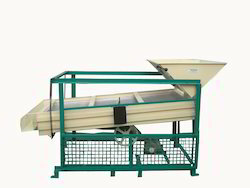 Ltd. is one of the leading Indian Manufacturer and Exporter dealing in Agro Machinery. The Grader Machine can grade several food grains like Wheat, Bajra, Green Gram, Black Gram, Soya Bean Seeds etc. The grading is done depending on the size of the screen. The items of similar size or lesser than the hole size of the screen are passed onto the next screen while items having larger size get collected and are passed out of the machine due to the vibratory action of the screen via the outlet opening present at the specific screen level. The similar kind of process takes place on the second screen also. Rajkumar's Grader / Chalna Machines is well suitable to be used worldwide. Rajkumar Agro Engineers Pvt. Ltd. looks forward to cater to your needs. For more details, please drop in an inquiry, with your full name, complete address and contact information. Looking for Grader Machine ?